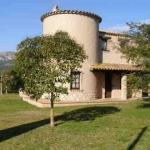 This four bedroom villa is located in Torroella de Montgrí. It features a kitchen which includes a ceramic hob, oven, microwave, fridge freezer and washing machine, leaving room and bathroom. For shared used offers a swimming pool and patio.